Around the Horn in 80 days. I look forward to your writings tomorrow morning for me. Enjoy your early morning walk and I look forward to the sun rise and sunset. Kathi, just to be sure, is it OK if I post that picture on my blog? Enjoying your blog. Rio ranks as one of my all time favorite ports (Veendam 2017). Even tho HAL ranks behind Crystal for you, know that your HAL cruiser friends appreciate you! 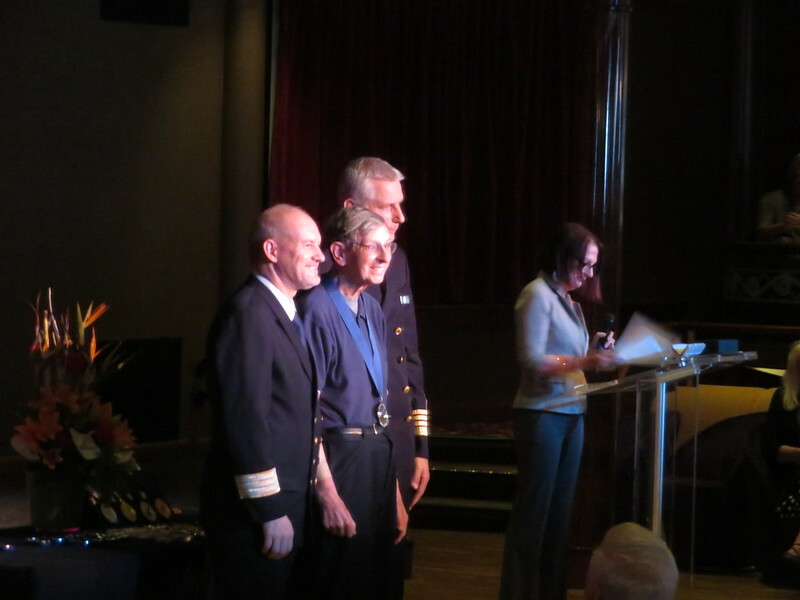 You are indeed a lucky man to have 300+ days of memories aboard their ships and so many of them on the Prinsendam. May you earn many more days and cherish those memories. We are entering a period of alternating sea and port days through March 6. The days are getting both earlier and shorter; from our departure from Rio to noon today we moved about 4 degrees to the east (corresponding to a 15-minute difference in time), and the days get shorter both because we move closer to the equator and because fall is approaching in the southern hemisphere. It was also quite cloudy and the best colors I got were about 5 minutes before sunrise; they were not as nice after the sun should have been out. It was quite windy (30kt plus) and when I went out it was quite difficult to push my way across the bow. I cut my walk from 5 miles to 2 but eventually walked another mile a bit at a time. Later in the day the angle of the wind seemed to be a bit less of a problem. My highlight of the morning was the Mariner Awards reception. The ceremony was in the showroom at 10:30 with Adagio providing music. 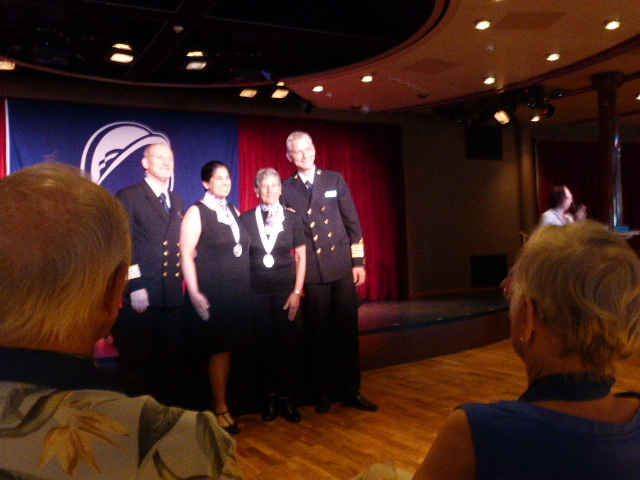 The purpose of this ceremony is the presentation of medallions, essentially symbolic recognition of milestones of actual days cruised with Holland America. Each person or couple is called to the front where the Captain and Hotel present the award individual with a photo taken by the ship's photographer. There were 25 Bronze medallions (100 days), 46 Silver (300 days; my turn came in the middle of that group), 11 Gold (500 days), and 5 Platinum (700 days). I took photos of the last few. The ceremony ended about 11 and we adjourned to the dining room for brunch. The penguins were dressed up in the lobby. Our group pretty well filled the main section of the dining room; the regular lunch was moved to the forward section. We had a largely set menu (posted under the menus tab of the blog) with w choices of starter and 3 entrees. 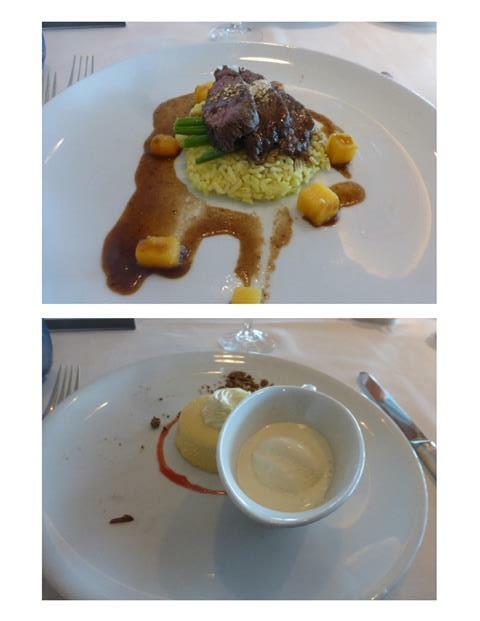 I skipped the starters and chose the beef tenderloin. There was a presentation in the showroom while I was at lunch. Jim McParland spoke about minerals of Brazil. I have not heard of anyone attending to know how it was. In the afternoon Vivianne Rowan had a talk. The published topic was Brazilian Festivals but she only spent about 15 minutes on that and I think I dozed off on the remainder of her talk. She was followed at 3 by Heather's introduction to Fortaleza and Belem. It sounds like this voyage will be quite different from the one in 2013 because the dry season ends in December and we are now into the rainy season. It was just Jim and I at table 19. I learned in the evening that Patty had not just "not been feeling well" but was actually quarantined in her cabin while we were in Rio. 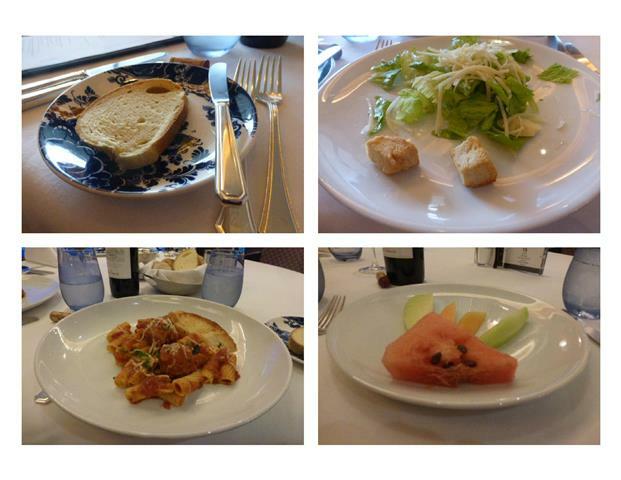 For this dinner I chose the pasta and the fruit plate. The featured entertainment was Rogerio Tutti. 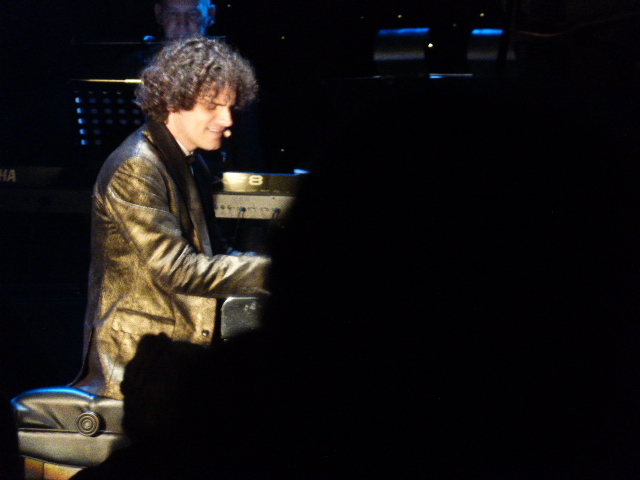 He is primarily a pianist but also does arranging and conducting. The screens showed a closeup of his hands doing their magic. He played a variety of music from classical to Broadway to pop. I very much liked his show. My parting shot will be about loyalty. 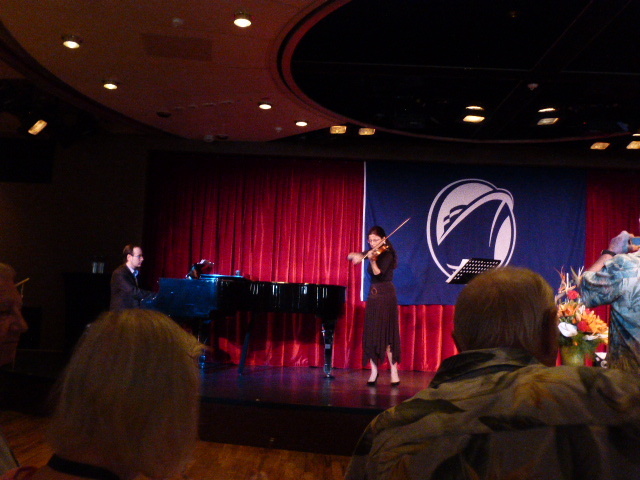 When I attend these events, regardless of the cruise line the common greeting is "Welcome to our most loyal cruisers". If only they knew. A lot of people seem to think that a loyalist can never stray from "their" company but I don't think I'm alone. One of my tablemates at the brunch shared that he had also been on my 2018 World Cruise, and I saw several other Crystal Northwest Passage parkas while we were in Antarctica. My tongue-in-cheek quip is usually "when a cruise line stops looking at other customers I'll stop looking at other cruise lines". I'll leave it to each person do decide what loyalty means to them. The perks from Crystal sound like the best of any of the cruise lines that I heard about. I think how good a lines perks are what appeals to an individual but I like them as well. One thing I didn't mention is that nothing is automatic; they are "banked" until you request them. I chose a 7-day European cruise as my free one because it had a high per diem and when I was on the World Cruise last year I checked my account a couple of weeks before the end of the cruise and told the "Crystal Society Hostess" 'use this, this, and this milestones for my onboard credit' because the amount is a bit different for different milestones. I think I paid about $10 after 124 days on the ships. Roy - I’m really enjoying your posts. Could you tell us about Crystal compared to HAL? Crystal appears to be much more expensive than HAL. Is the experience (food, service, etc.) much better? difficult at least for me to pursue my walk! As always glad you got some walking time in. I’d be on the treadmill. Nice Mariners Awards ceremony too. I’m sorry to hear Patty is sick and quarantined . Hope she is well soon! You stay healthy Roy. I am enjoying my morning reading. Cute -- penguin with the medals. That is a great deal. Thanks for your comments and pictures. Love reading about your day. Okay My eyes have been giving me a lot of problems the last couple of days. I have looked and looked and can't seem to find the picture of Roy receiving his 300 day medal. Enjoying readings your reports, congratulations on 300 cruise days with HAL. Here is Roy getting his medal. Here it is again. With the new Cruise Critic format I think post numbers are REALLY hard to read even with good eyes. Nice shot, Kathi 🙂. thanks for posting it. On another brutally hot day I walked 6 laps (1 ½ miles) very early. The sun found a crack in the clouds on the first couple of laps on my walk. 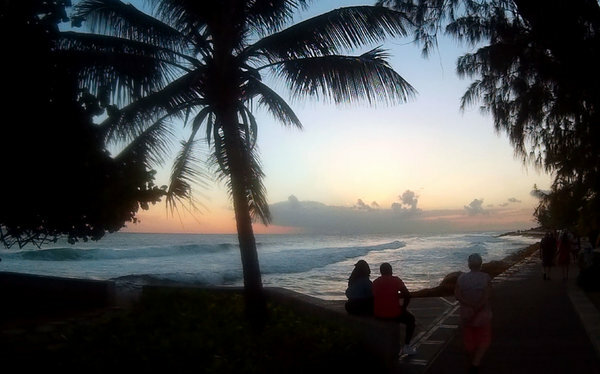 This was my first visit to Ilheus. The small city (about a quarter million souls) sits at the mouth of the Rio Cachoeira. 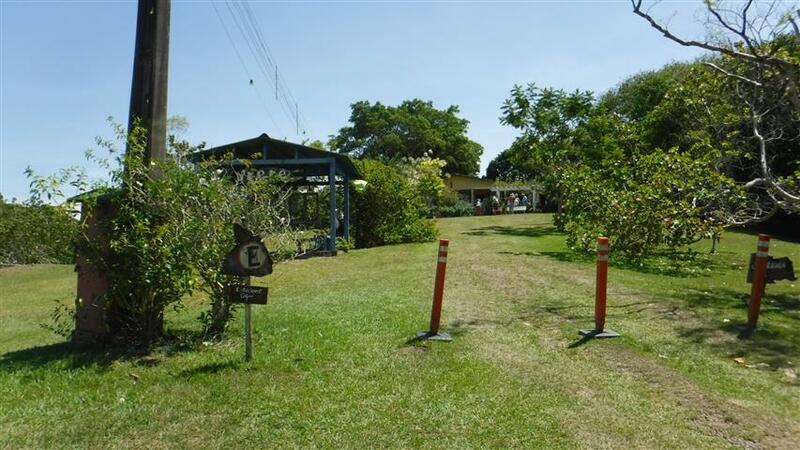 There were just 2 tours offered, one featuring a waterfall (6 hours, $70) and the other a visit to a cocoa farm (5 hours, $50). It appeared there were just 2 bus loads for each tour so most people must have either taken the shuttle or stayed on the ship. I opted for the cocoa farm and left the ship about 8:20. The tour description kind of short changed the time we would spend in town, about an hour and a half. We didn't walk very far but it was still hot. We disembarked near an old school; what caught my eye was inscriptions above the windows on one side for boys and the other for girls. 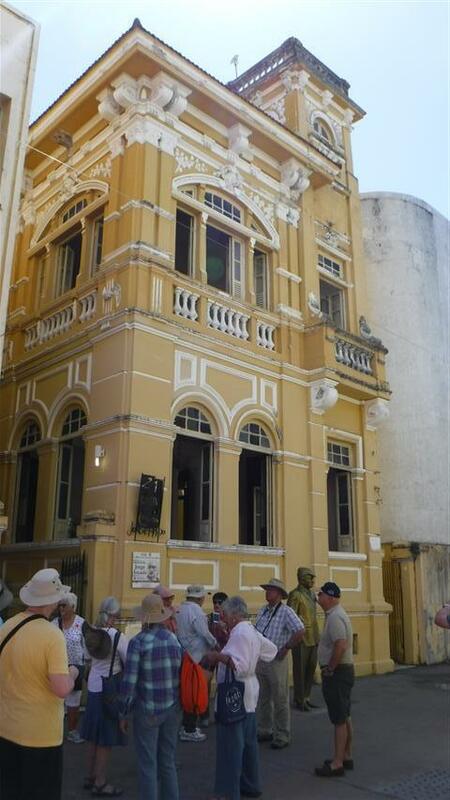 Our guide explained that many of the old buildings came from "Colonels". They were not military people but the rich could buy a title by donating some work to the city. 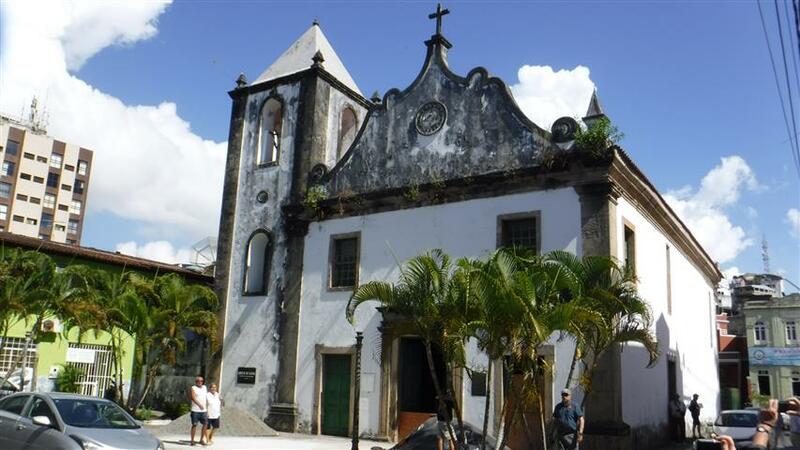 Just a block away was the San Jorge dos Ilheus church, the oldest church in the city from the 16th century. It is currently closed for rehabilitation. 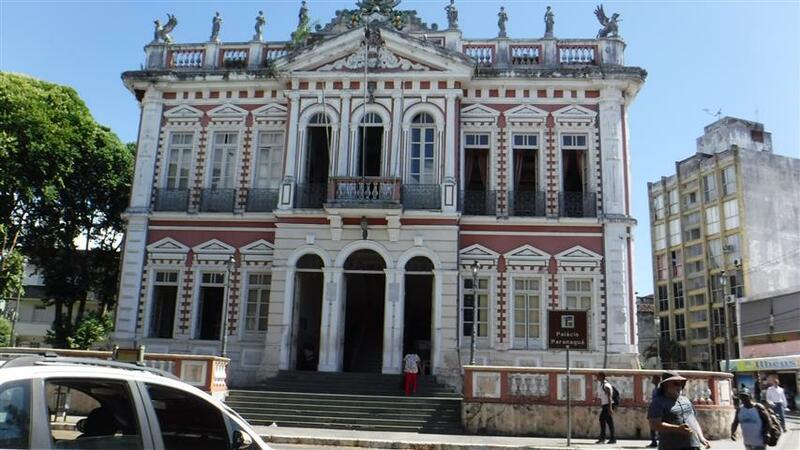 The Paranagua Palace was built as a hotel in 1907. It is now the city hall. 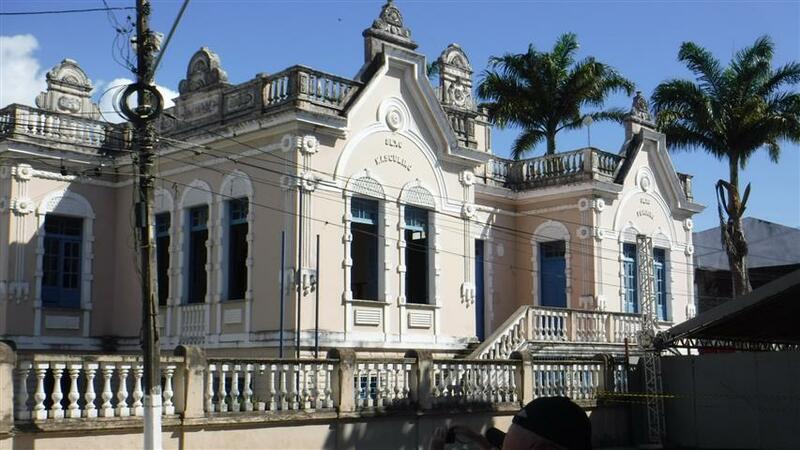 I noticed that all the windows were open; I think air conditioning is pretty rare in Ilheus. Nearing the end of our walk (at least in distance) we stopped at the Jorge Amado House, once the home of Brazil's most famous author but now a type of cultural center. It was very hot and crowded and I soon took refuge in a bit of shade at the nearby square. 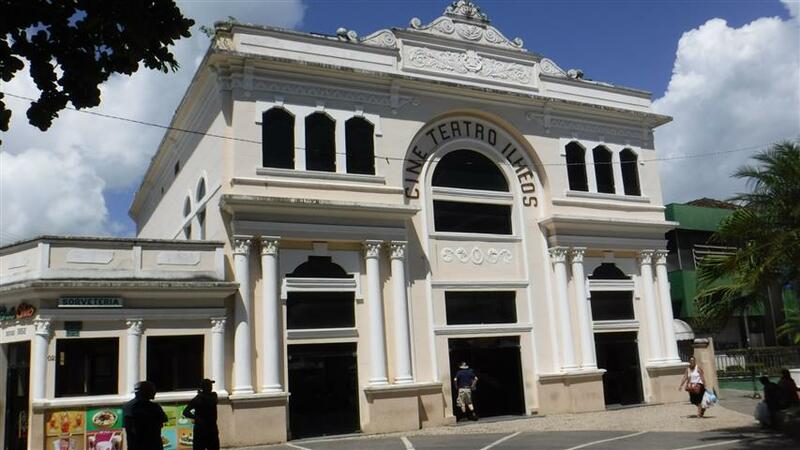 The Cine Teatro hosted live performances in the early 20th century. It still gets some kind of use but I'm not sure what. We visited a chocolate shop for a while. I did not buy anything but did soak up the air conditioning for a while. 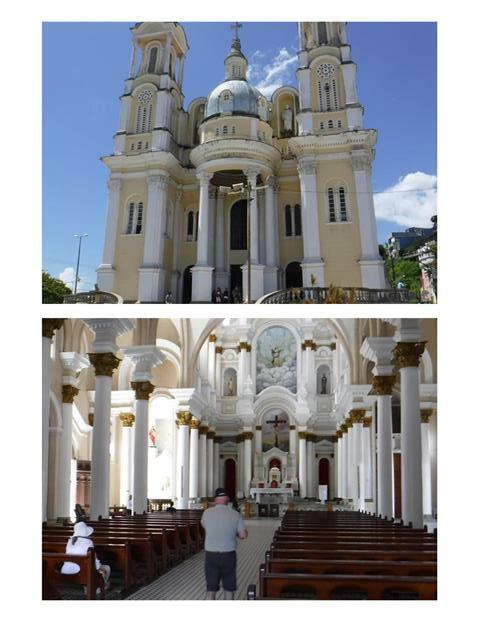 Our final stop in town was the San Sebastian Cathedral, dating from the 1930's. A few cool breezes but still quite hot. It was about a half hour ride to the Cocoa farm. The owner spoke very limited english with the guide translating as we got an orientation at a little pavilion (behind the pole in the photo). We took a bit of a walk through the fields. 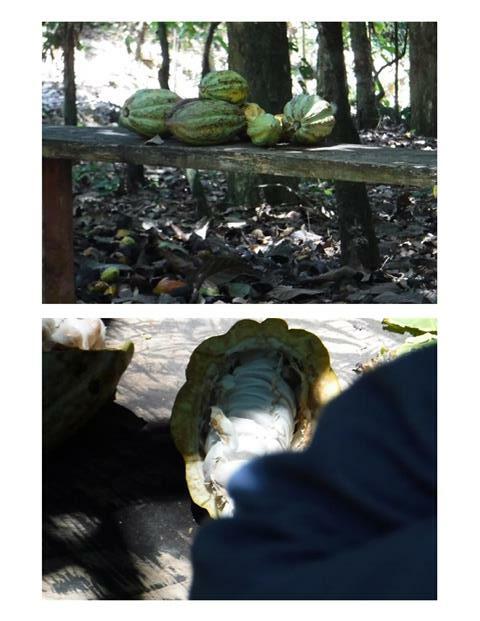 The cocoa crop has been badly hurt from a fungus but not completely wiped out. The crop grows in fairly large pods with white beans inside. Returning from the field we stopped at the drying sheds. The beans are spread out on a platform where a roof can be rolled over the beans in the event of rain. We ended our tour at the farmers house. 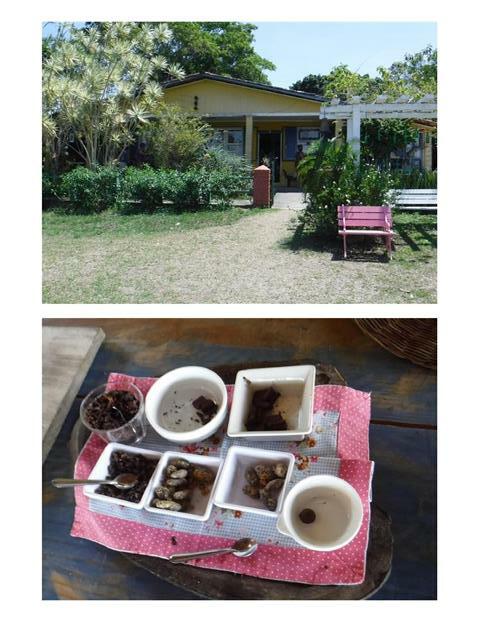 There was a pavilion to the side where we sampled different types and stages of chocolate. 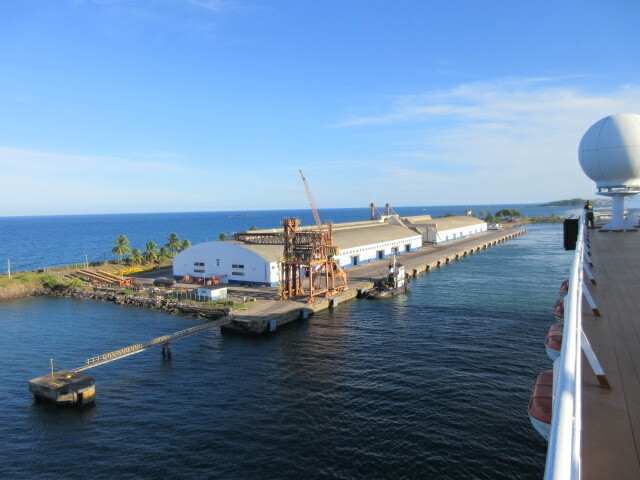 We returned to the port about 2. Lunch was a salad and pizza. It was too hot to spend more than a few minutes at a time on deck. All aboard was 4:30 but we and we left soon after that with Staff Captain Paul at the controls. As the port faded behind us I noticed something I thought was pretty unusual. We were the only ship in port, not the only cruise ship but the only ship. Our only company had been 2 tugs and the pilot boat. I wonder if they locked the gate behind us as we left. There was a special menu in the Pinnacle Grill, South American Street Food Festival. It was again just me and Jim at table 19. I chose the fruit cup, the striploin steak, and the blueberry sundae. The featured entertainment was a second performance by Akos Laki and his saxophone. I had not planned on going and it's just as well because I was pretty well spent. Many of my readers now I've become obsessed with Come From Away and I played my CD of the show which kept me awake long enough to organize my photos but not long enough to write anything. By the way, the touring cast is coming to Baltimore at the end of April. Unfortunately, I'll be on the Nieuw Statendam transatlantic at the time but the stop before that is in Pittsburgh which is within driving distance. Within the last week I've secured tickets for that stop, my 4th time to see the show. 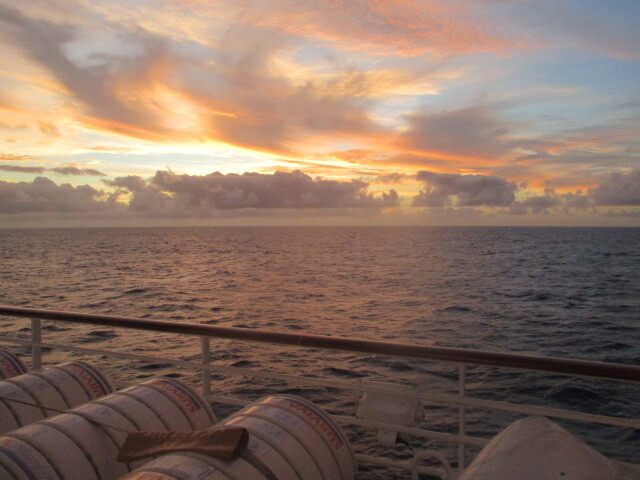 My parting shot will be recycled from 2012 when I was on the Zaandam in Thailand: "I'm afraid no parting shot tonight; if there was one it would probably be about how tiring tropical heat can be." Now that I'm 7 years older I certainly don't tolerate the heat any better than then. I love the tour you chose -- especially the chocolate part. We have a couple of pieces of dark chocolate each evening. The old time buildings with all the ornate windows, roofs, etc., were always the most beautiful to us. We can no longer tolerate the heat either. Great report -- love the pictures. Great pictures from your tour. Wonderful architecture. And chocolate - sounds wonderful. It's -9 here now, a little bit of your heat would be nice. 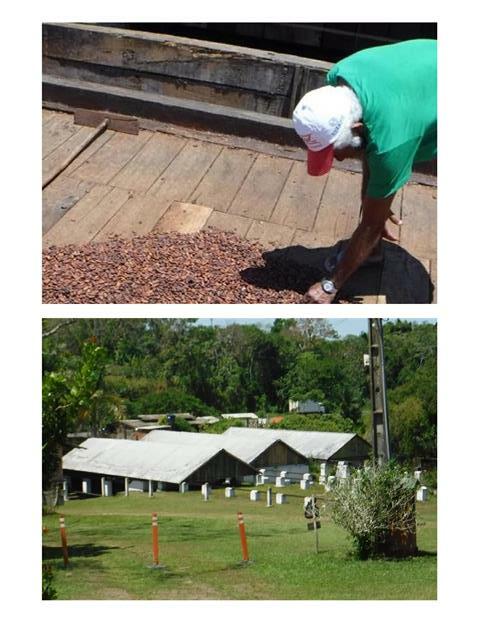 Cocoa Farm looked interesting, but with the high heat any chocolate for me would probably turn into hot chocolate ! The pictures of the buildings with the ornate architecture was great! On both of these cruises I am paying significantly less than I would for a Neptune Suite on HAL yet I have a suite experience. It’s kind of like real estate, do you want a bungalow in the best neighborhood or a mansion in a more modest neighborhood. Either choice is reasonable, it’s a matter of personal preference. My other mantra is “every cruise is different” and I have an example. 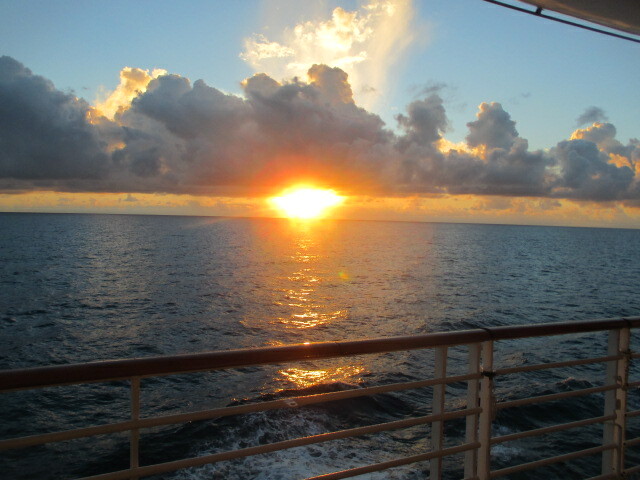 In 2012 I looked at a 15-day Crystal world cruise segment from Singapore to Hong Kong. I ended up booking pretty much the same itinerary on the Zaandam (14 days while I think Crystal had an overnight in one port). For what I would have spent on that Crystal Cruise I got (1) 14 days on the Zaandam, (2) a 7-day QM2 Transatlantic, (3) a 14-day transatlantic on the Crystal Symphony, and (4) a 7-day Canada cruise on the Crystal Symphony. That’s 14 days on the Zaandam, 7 on QM2, and 21 DAYS ON CRYSTAL for the price of 15 days on Crystal. One more thing, that Crystal Transatlantic was a northern version, much like the westbound half of the Voyage of the Vikings but my per diem there was less than I would have spent on an inside cabin on the Maasdam VOV. I’m going to call that a win-win-win. Thank you, Roy, for the breakdown. That is very interesting comparison, I'll have to look into that, since I always go single. Thank you Roy for taking the time to do the break down between HAL and Crystal. 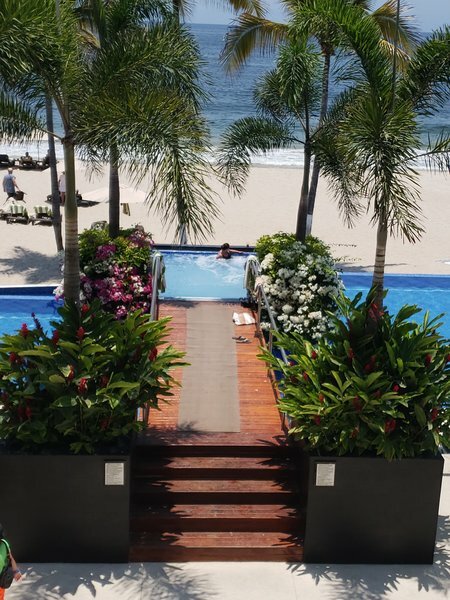 On HAL, 10 day to Panama Canal on Zuiderdam, we paid about $150.00 per person per day for an unobstructed balcony cabin, $14.50 per person per day for the hotel service charge, plus $129.99 for internet. We didn’t pay for any ship tours, but prices were generally $50 - $200 per person. 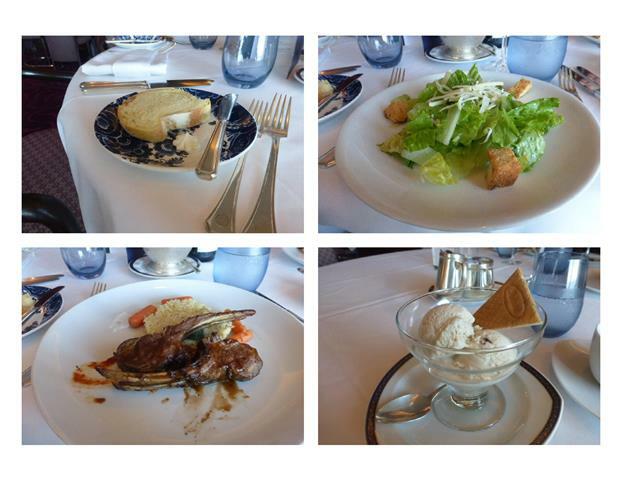 We didn’t pay for specialty restaurants (but we have paid for Tamerind on ships that have that specialty restaurant.). We also had the HAL shareholders on-board credit. What services, fees, etc. that HAL charges for, are free or included on Crystal?